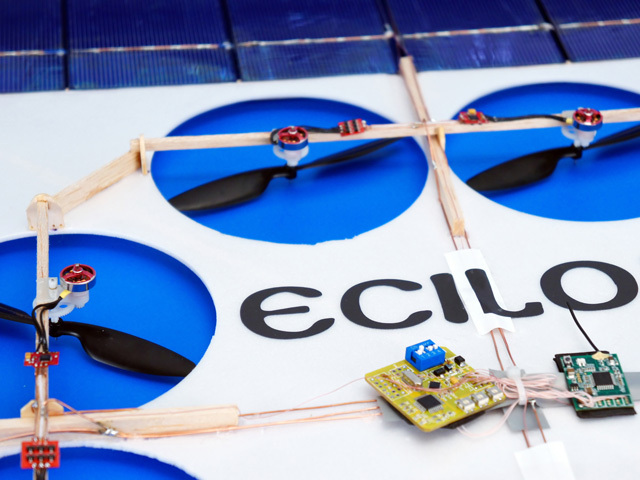 Ecilop Solar (Ecilop-8) is the first in the world radio-controlled multi-copter that uses solar energy as the sole source of energy. It also could be called a Hovercraft or a Ground effect vehicle. The drone is controlled as a quad-copter, 8 rotors are connected pair-wise. There is no onboard battery. To configure controllers inside a building, the user connects an external battery. 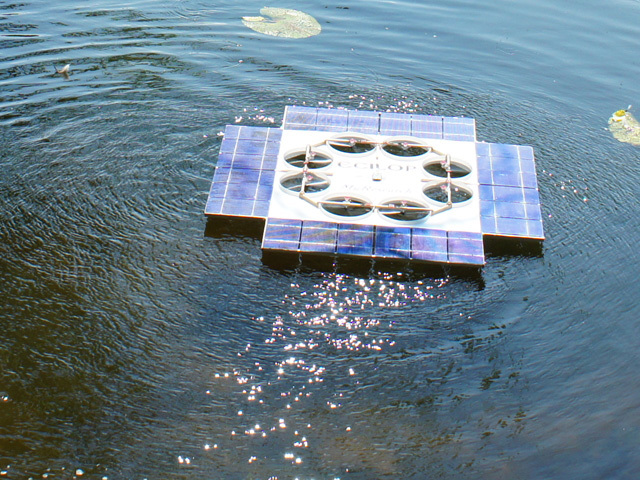 To restart the controller in sunlight, the user bridges the power leads. The vehicle remains airborne because of ground effect and automatically maintains a horizontal attitude. If the control panel allows mixing of control signals for the multicopter's different motors, no on-board flight controller need be installed. 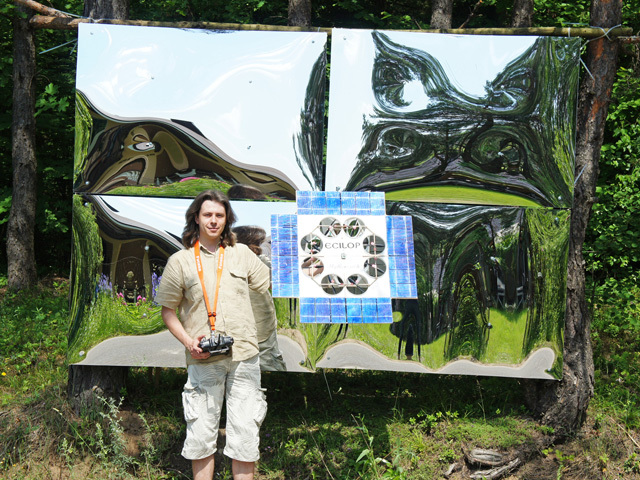 We utilized a mirror to concentrate solar energy in order to raise the vehicle higher off the ground. This is not a commercial project and the drone is not available for purchase. Reducing in-flight power consumption requires lowering the rotor disk loading. This means that we need to increase the diameter of the rotors and decrease the rotation speed. 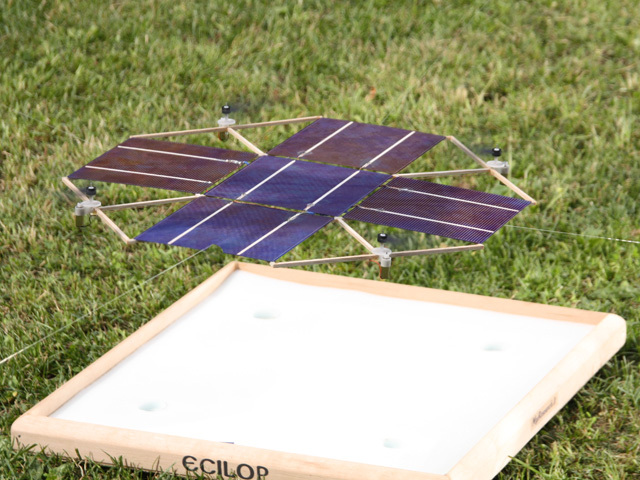 In Ecilop-8, the frame carrying the solar panels acts as a screen, thus providing extra efficiency. A good example of a highly efficient drone is the man-powered GAMERA-II. This aircraft has a rotor disk loading of 0.176 kg/m^2 and a static thrust of 203 kgs/kWt. If the muscle power is replaced with an electric motor with modern Li-on batteries (as of 2012), the flight duration of the drone will exceed 20 hours. q - pressure in pascals, p - air density (standard value: 1.225 kg/m^3), V - speed in meters per second. Air pressure of 1 m/sec wind on 1 square meter of surface approximately equals 0.06 kg of force; pressure of 20 m/sec wind is around 25 kg of force. Light civilian helicopters have a disk loading of 15-20 kg/m^2. S - area, p - density, V - speed. For 3 m/sec wind and an area of 1 square meter, the approximate air power is 16 W, and 1058 W for 12 m/sec wind. Therefore, the projected desirable solar power is several times lower than the regular and undesirable wind power. This means that practical application of solar-powered multi-copters is impossible. A small multi-copter will require miniature DC motors with a gearbox. Static thrust should not be lower than 10 g per 1 W of energy. 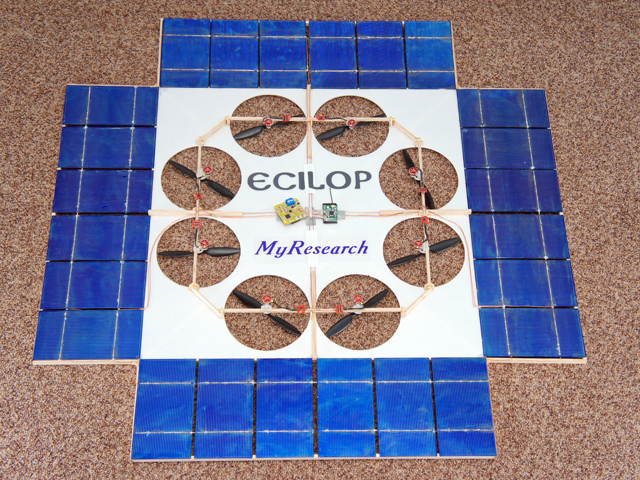 If the drone is not controllable, the voltage of the solar battery must only be sufficient for hovering. 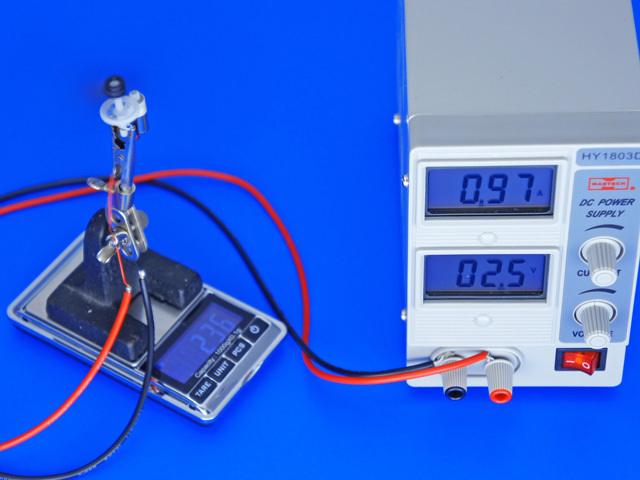 For instance, if 3V is enough for take-off, the solar battery must consist of six elements. 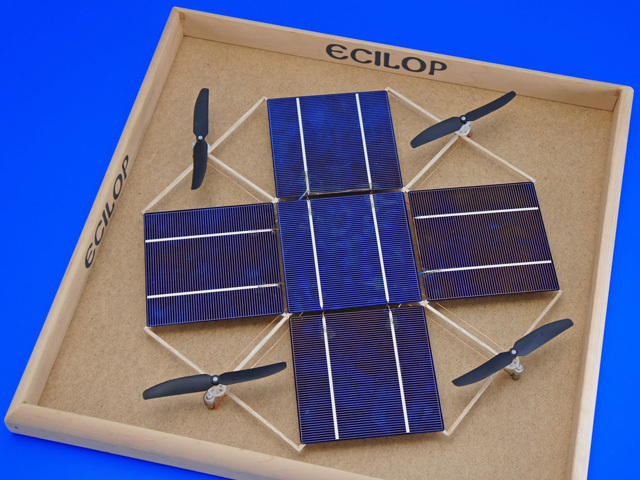 By increasing the area of your solar panels, you will enable the drone to take off under worse lighting conditions. 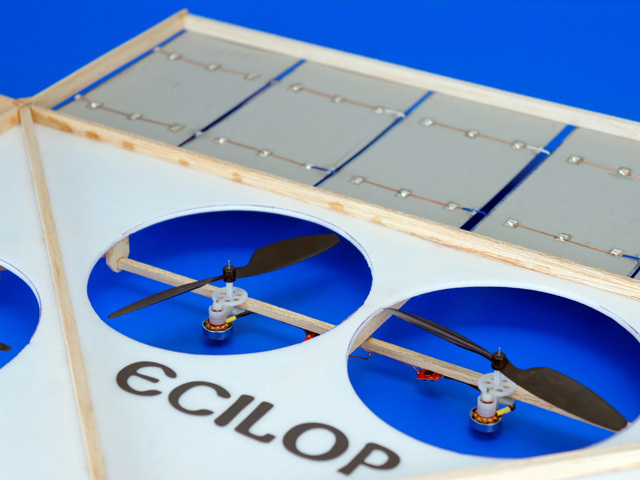 However, large panels will be too heavy and the drone will not be able to lift them. Cell wires: AWG24 with thin insulation (AWG26 for two parallel lines). 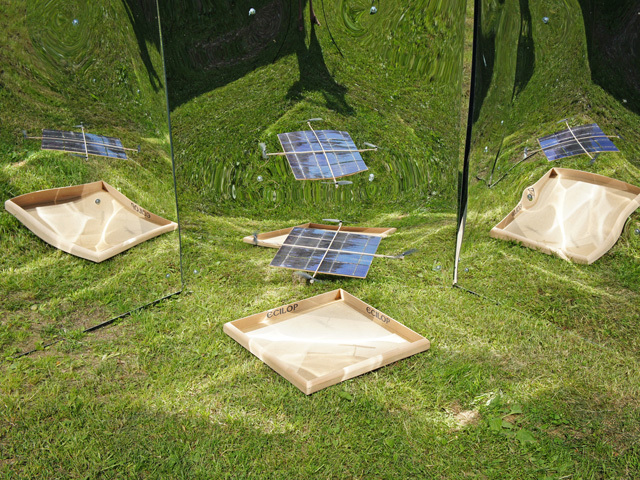 If the intensity of the sunlight is not sufficient for lift-off, use a mirror for additional lighting. 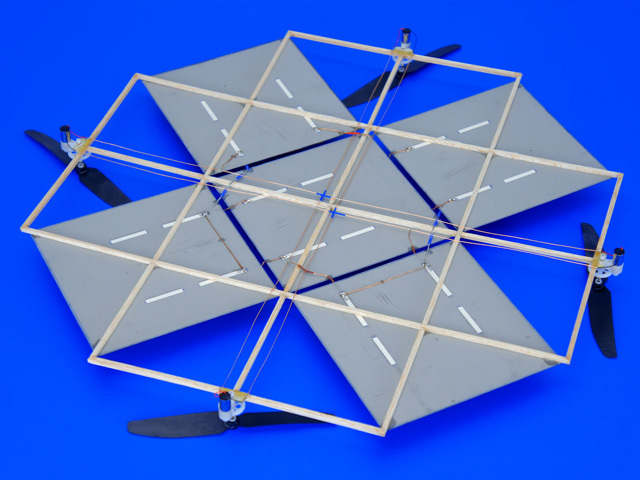 A larger multi-copter will work with propellers used for F1B class planes (Model Aircraft with Extensible Motors Wakefield). You will need to find a lighter motor with a power output matching the potential power of the batteries. The gearbox should lower the RPMs and provide a higher static thrust of the motor.